Grandma's Favorite is a popular, traditional five-patch quilt block pattern with a pinwheel in each of its four corners. 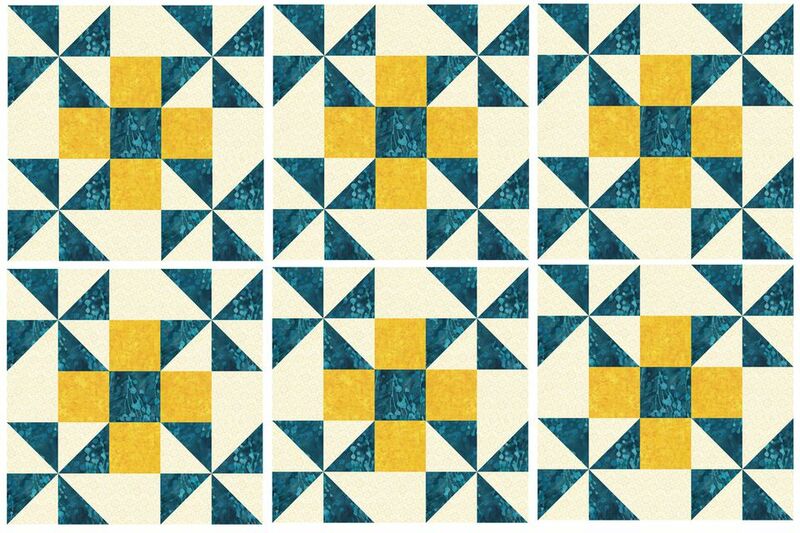 The quilt block can be assembled in different ways but we'll make it with a combination of half-square triangle units, easy strip piecing, and plain squares. Finished Quilt Block Size: 10" x 10"
Change fabrics to suit your needs. The same background is used throughout in the example. Pinwheels in the four corners of the quilt block are blue and background. Blue is repeated at the block's center. Yellow-gold stands out near the block's center. Pair each 2-7/8" blue square with a background square of the same size. Use my easy quick piecing instructions to sew the two together, creating 16 half-square triangle units that each measure 2-1/2" x 2-1/2". Press the seam allowance towards the darker strip. Square up one end of the strip set you just made and then cut four 2-1/2" wide segments from it. Arrange the components as shown in the upper left portion of the illustration. Create four pinwheels for block corners, taking care to orient the triangles as illustrated. Sew each of the four pinwheel groups together. Sew a golden-yellow/background unit between pinwheels in the top and bottom rows. Press seam allowances towards the rectangular units. Sew together the components of the middle row, pressing seam allowances towards the center square. Sew the three rows together, matching seam intersections carefully. Press. The quilt block should measure 10-1/2" x 10-1/2". Repeat to make more blocks as desired. Make this quilt with 16 Grandma's Favorite quilt blocks sewn into four rows of four blocks each. Surround the quilt top with two borders that repeat fabrics used in the quilt blocks. The quilt finishes at 50" x 50". Dark half square triangle units at the corners of blocks come together to form dark pinwheels. Alter the color or the contrast of those patchwork pieces to change the quilt's appearance. Experiment with fabrics to find a layout you love. Cut 1-1/2" wide inner border strips and 4-1/2" wide strips for the outer border. The interior borders and the first two outer borders can be cut from single crosswise grain strips of fabric. The remaining two borders must be either pieced or cut on a long yardage to achieve the correct length. Beginning quilters -- learn how to measure and sew borders to a quilt before you begin. You might prefer to use borders with corner squares.